Achieving a Bohemian, laid back style in your home very much relies on embracing nature, and welcoming it into your home. Don't think for a minute that we are suggesting you fill your home with live wild animals, but simply use animals for inspiration in your homes interior. 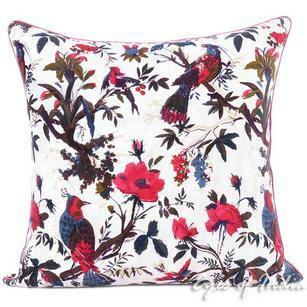 One of the easiest ways to achieve this, is through the use of our Bird Cushions. 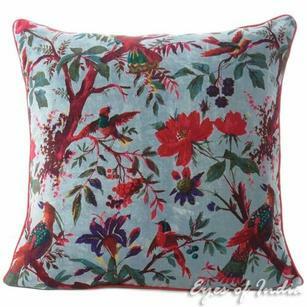 Symbolising freedom and hope, we supply a large range of Bird Cushions and Bird Pillows in a variety of styles, shapes and sizes. All are truly unique, and have been handcrafted by Artisans in India. Combining centuries of knowledge, with modern printing methods - the result is a high quality, unique product which stands the test of time. 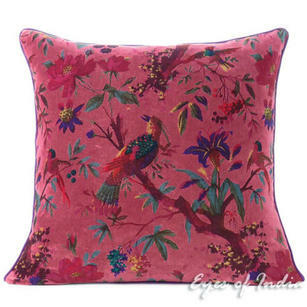 In purchasing from us, you can rest assured that your purchase helps protect the arts and craft industry in India, whilst ensuring you receive a truly unique, handmade product. As always, if you have any questions about this range - please do just get in touch and we will be more than happy to answer any questions you may have. Blue Velvet Colorful Decorative Bird Throw Sofa Cushion Couch Pillow Boho Bohemian Cover - 16", 20", 24"
Gray Velvet Colorful Decorative Bird Throw Sofa Cushion Boho Bohemian Couch Pillow Cover - 16", 20", 24"
Olive Velvet Colorful Decorative Bird Throw Sofa Cushion Boho Bohemian Couch Pillow Cover - 16", 20", 24"